First Presbyterian Church is located on the corner of 4th Street and Jefferson Avenue in Pulaski, Va (408 N. Jefferson Avenue). From Dublin: Follow Lee Highway/US Route 11 into Pulaski. 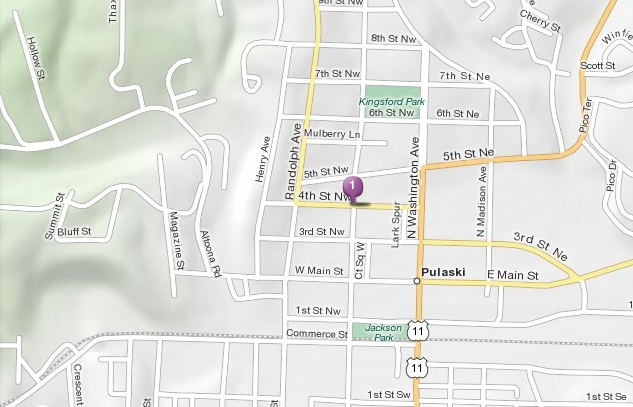 Continue straight through the flashing traffic light as the road brings you into the town of Pulaski. Turn left onto Jefferson Ave. The church is on the left side of the road at the corner of 4th & Jefferson. From North of Pulaski on Interstate 81 South: Take Exit 94 towards Pulaski. Turn right at the end of the exit onto Route 99. Stay on Route 99 through the town of Pulaski. Turn right onto Jefferson Ave. The church is on the right side of the road at the corner of 4th & Jefferson. From South of Pulaski on Interstate 81 North: Take Exit 89B towards Pulaski. Turn right at the end of the exit onto Route 99. Stay on Route 99 through the town of Pulaski. Turn right onto Jefferson Ave. The church is on the right side of the road at the corner of 4th & Jefferson.